Chris was born and raised in Attleboro, MA. He graduated from the University of Hartford with his Doctorate in Physical Therapy in May of 2017. 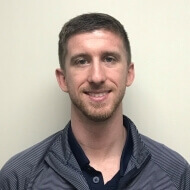 Chris’s clinical experience includes working with individuals in the outpatient and inpatient settings with a wide range of conditions, including: orthopedic injuries, pre/post-operative rehabilitation, and neurologic and vestibular diagnoses of all age groups. Chris has a background in high school and college athletics and has an interest in pediatric and orthopedic/sports rehabilitation. Outside of the office Chris enjoys exercising, playing golf and hockey, snowboarding, traveling, and spending time with family and friends.